It may only be a few days until we get to lay our eyes on the iPhone 5C after much speculation, but that hasn’t stopped further leaks from surfacing. This time it’s the logic board destined to power the iPhone 5C, and it shows a few minor changes from the current iPhone 5. There’s not too much that sticks out about the above picture leak, at least obviously anyway, since the protective EMI shielding obscures much of the internal circuitry. 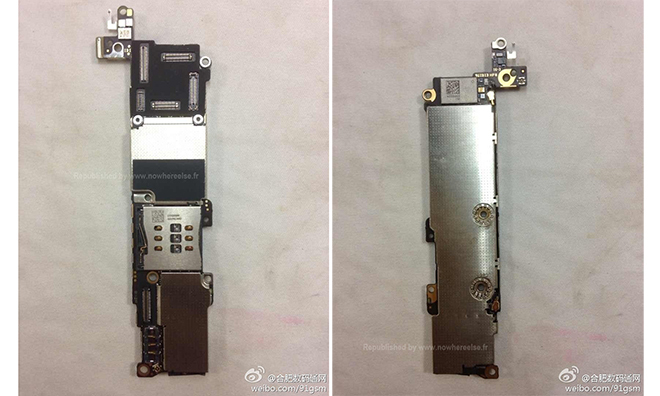 However, the bits that are left uncovered show some small differences to that of the logic board found in the iPhone 5. Positioned at the top of the front of the logic board shows five connection points that connect out to the unit’s display, microphone, speakers, and camera. It’s this area that shows the biggest difference from the current iPhone 5 logic board. On the iPhone 5 logic board, an STMicroelectronics three-axis accelerometer is positioned just above the first EMI shield that covers Apple’s A6 SoC. With the purported 5C board, it appears that the accelerometer has been repositioned, or is hidden beneath the black covering surrounding the connectors. It is not yet known what processor the iPhone 5C will utilise, but the shielding on the leak is almost identical to that found on the iPhone 5, so it is possible that Apple will keep the current A-series chip in order to keep costs down, which would tie up with recent rumours we’ve heard. The Nano-SIM port is positioned above another shield, probably covering the phone’s modem and the RF transceiver. The battery connector is found to the left of this covered area. We’ve only got a few more days until the iPhone 5C is expected to be revealed to the world, and if the leaks above are anything to go by, it seems it will mimic the iPhone 5 components, which we expect.